Obviously we were impressed by HdV’s version, and this is much of the same – visually impressive, but not filled with as many “I want to eat all of that” moments as it’s seafood sister. An infinite amount of ham, cheese, smoked salmon and bread still ticks the continental box, with the Mal spin on things being the chef whipping up some (good) design your own omelettes, eggs, waffles and things. Eggs are a lot more brunch-y than Oysters, no? 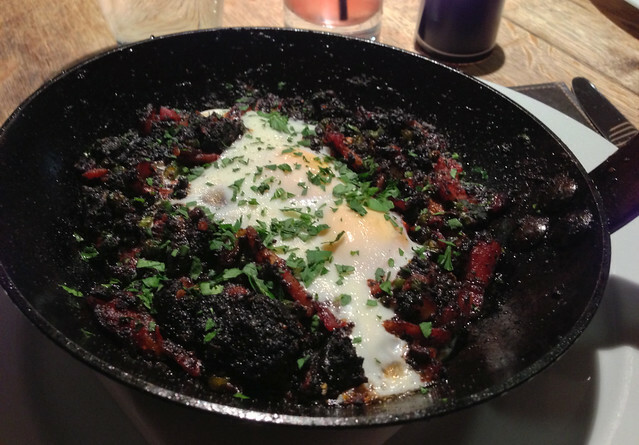 Mains are again very similar to HdV – check out the frying pan huevos rancheros below. It had been a heavy night out in Jesmond the night before, and this was an alcohol absorbing, sumptuous and comforting pile of salty meat and juice that beat any full English. A bit light on tomato/spicyness and heavy on black pudding, but that’s not necessarily a bad thing. 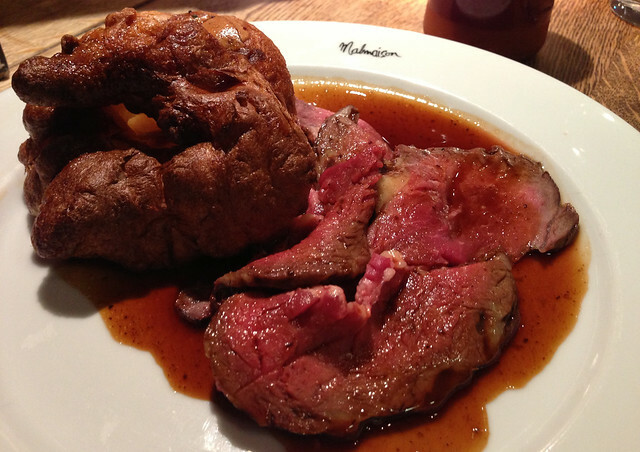 We also take on the roast beef. It’s a good one, with thin slices of pink as you like beef, a canny, enormous yorkshire pudding, and some cracking roast potatoes complement roast courgettes(?) and other veg. Come here hungry and just go mad on buffet table/roast dinner and you’ll get your moneys worth, which ever way you look at it. We’ve had some canny desserts at the Mal previously, so we also took on desserts and the impending food coma that followed. The creme brûlée didn’t match up to the HdV version but was oozingly creamy all the same, and reassuringly dotted with vanilla beans. 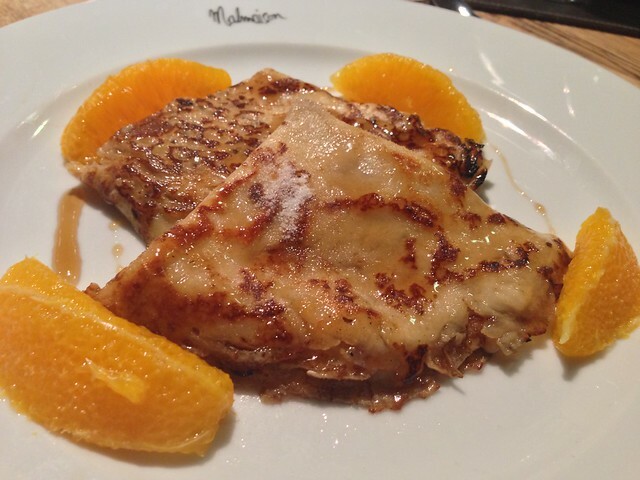 Seeing crepe suzette on the menu inspired thoughts of a retro flambé party-type affair at your table, but was just delivered plated up, and a bit light on sauce, which was a tad disappointing. We get massive pots of tea and coffee, which are an extra for £3 each – it’d be nice if they were included. 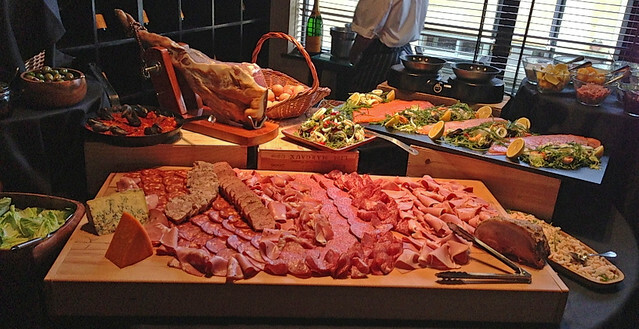 Either way, check out our take on HdV – choose your preference of venue – you are either a Malmaison lover or hater – take the loosest smart pants you can get away with, and pig out and take your time over Sunday lunch in some comfort and style, and get your £ worth on that buffet table. This the probably the best “upmarket” hangover cure there is. Or you know, just take your family out for a posh lunch. Do yourself a favour and get down sharp-ish as of now (16/06), the brunch is buy-one-get-one-free with a deal in Appetite mag. Winner. Contact: www.malmaison.com. Food hygiene: 5. Served Sunday 12-5. 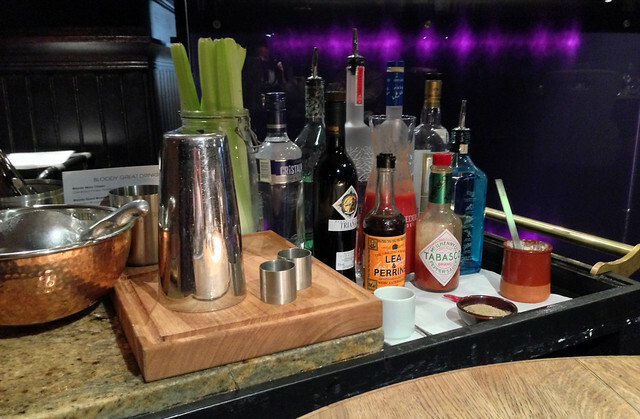 The Malmaison Sunday brunch menu is £19.95 per person for four courses served after 12 on Sundays only. We were invited to try the menu by the hotel.